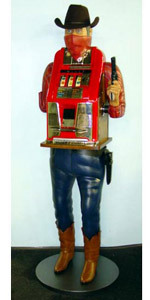 ONE ARMED BANDIT - FROM THE BILL HARRIS WESTERN FIGURE COLLECTION - The One Armed Bandit is carved wearing his mask. One arm is missing, and his shirt sleeve is tucked under to indicate the missing arm. A cast gun hand replaces the handle on the machine. With the Mills Classic Hightop remanufactured by MILLS BELL-O-MATIC, the figure stands just over 6 feet tall. Price and availability will be quoted.